Having spent a lot of time either training this age group, climbing with them at the crag, route setting for them indoors or drinking down the pub, I feel like I've picked up some important lessons over the years! We're all very aware that as we get older, physical activities become increasingly tough (especially strength, power and agility-wise) and often this leads to a decrease in climbing performance. This is can also be accompanied by increasingly frequent periods of injury or ill health. Is it all a downhill journey though? Can you actually improve your climbing post-50? I would argue that you can and I'm going to try and convince you! Keith Sharples climbing into his 60s. Firstly, I want you to try and be objective about your "training age" and by that, I mean the number of years you've been carrying out some kind of systematic, structured training. Secondly, I want you to think really hard about whether you're most driven by sporting "health" or sporting "performance." Your health is related to your injury rates, general well-being each week, how frequently you could do your activity if time were unlimited and how well you recover. Your performance has more emphasis on bringing to "peak" your strength, endurance (both of course, affecting your top grades!) and ultimately operating close to your limit. It should be noted that achieving very high levels of both "health" and "performance" at the same time may not be realistic…which is why I think it's important to decide which side of the fence you sit on. Secondly, you want to write your conclusions down and discuss them with your climbing partners! Why? Because, much that we might disagree with people whom we regularly climb with, they're often unnervingly accurate about us. Objectivity is key here, because below I'm going to give you a bit of a matrix of structure to work to once you can decide on training age and health vs performance. Who are you and what matters? Yes, it's highly simplified and we all know that many people will feel like they sit somewhere along the spectrum and aren't at an extreme! But…At least getting to grips with the above and where your main thoughts lie, will help decide on a training approach. It may also help you avoid some of the classic pitfalls. Low training age – what do we see? In some ways, this is actually one of the better situations to be in, despite first appearances. The body becomes very accustomed to training with long periods of time (i.e. at least +5yrs) and we see the effect of "decreasing return on investment." What this means is that as we train for many years in a row, we need to put increasingly large amounts of energy into our training to reap the same relative rewards from the early years. In my experience, those climbers in the sweet spot of 2-5 years training will be highly adaptable to stimulus applied, yet conditioned enough to handle it. Mark 'Zippy' Pretty and Keith Sharples share training tips. High training age – what do we see? Whilst we now have the appreciation that effort "put in" may not directly reward with "results out" as training-age increases, we do have a couple of tricks that can be deployed. With a high "training age" we see the body being much more robust to high intensity work (strength) and having a high capacity for volume (endurance). This sounds great doesn't it?! Well it is, if you're disciplined and focused enough to realise this will create a couple of important factors when post 50 years. The first is that you will adapt to strength training but only if you're giving longer periods of recovery than when you were in your 20s and 30s. The second is that because you have a high capacity for volume (and often a strong mental approach for suffering) it's very tempting to do too much and not rest enough! This is the number one issue we see with more mature athletes – too much volume, not enough focus on intensity. Climbing health focused – what's really important? Steve McClure takes on the Lattice Board. Climbing performance focused – does it matter? Of course it matters! Just because you are no longer 18 years old, doesn't mean that you don't have a drive to perform at your best. 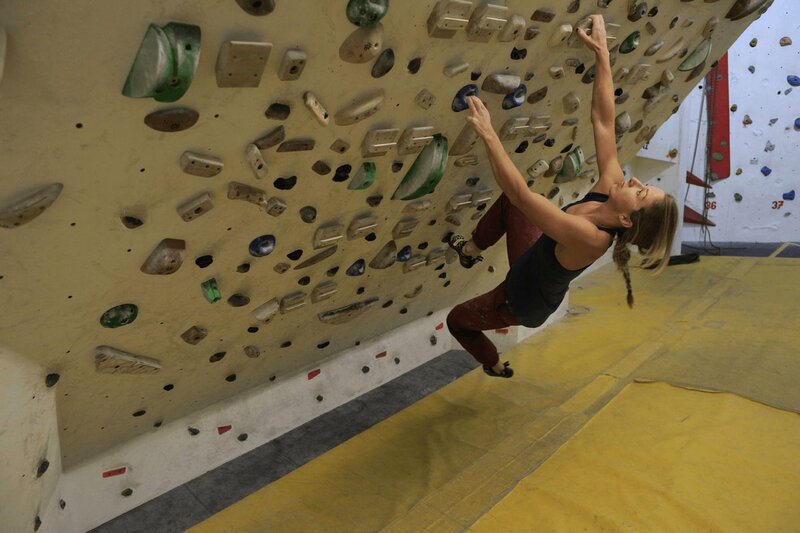 Year after year, I've come across some of the most passionate climbers in this age group who seem to have an urge for self-improvement towards their limits like almost no other. It's actually very inspiring and it continues to convince me that the mental game improves year on year through our lives and becomes an increasingly valuable asset. What is extremely important about pushing performance as you get older is that you will need levels of focus and discipline that your younger self likely didn't need. You'll need to know how to appropriately apply yourself to your "training age" and do it with dedication. Don't kid yourself, be realistic. Ask that climbing partner what they think! If you come to the conclusion that performance is most important, then you're going to have to make some sacrifices. Getting stronger means you can't climb at total max every other day, while staying injury free means you need to be extremely careful about training to exhaustion regularly. Also in the older group, the top grades are often associated with increased specialisation (angle, rock type, movement style etc). Read this recent UKC interview with Johnny Dawes, who talks about this. Last bits – there's always more! You don't need to sit inside this matrix. If you're confident that none of these apply to you and you're getting better each year and staying healthy, then keep doing that! I'm a strong advocate of sticking to what's working at present. Only reevaluate if issues crop up. Another group that doesn't really fit into this framework is climbers who stagnate with their training methods. I've seen lot of people try something out for a couple of years, see it work well and then continue to try and do so for the next 5 years despite seeing no further improvement. Don't keep hitting your head against the proverbial wall!